Joseph Maurice Ravel (French: [ʒɔzɛf mɔʁis ʁavɛl]; 7 Mairch 1875 – 28 December 1937) wis a French componer, pianist an conductor. He is eften associatit wi impressionism alang wi his elder contemporary Claude Debussy, awtho baith componers rejectit the term. 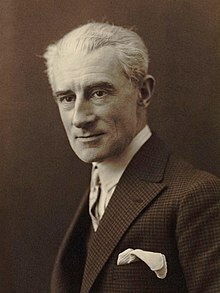 In the 1920s an 1930s Ravel wis internaitionally regairdit as Fraunce's greatest livin componer.